This entry was posted on January 15, 2014 at 11:43 pm and is filed under American History, European History, Human Ethology, superstition, Systems Of Moods. You can follow any responses to this entry through the RSS 2.0 feed. You can leave a response, or trackback from your own site. The Bible AND money lending. Ken: you are alluding to the fact that Luther allowed money lending? It existed before, though, from Jews. Also the Republic of Florence had instituted bonds (to pay for the Republic, or army, just like now), centuries before. Francois Premier was massively bankrolled by the Medicis before Luther got to publish his stuff. Charles Quint followed, fifteen years later, using German bankers. It’s true that, the more Florence borrowed, the more of a plutocracy Florence became. Until independence was lost. Genocide is in most major religions, and probably the minor ones as well. Great essay, Patrice. Do you think we humans can ever end it? If you haven’t read Pat Barkers trilogy, Regeneration, I think you might find it fascinating. However, even inside Christianity, there is a whole spectrum. For example, whereas Saint Bernard (350 years before Luther) was fundamentally a demented SS, Saint Francis of Assisi (at least the way I remember him from childhood reading) was innocuous. There is no doubt that some Christians, some Muslims, and some Buddhists live their religion in a fully anti-genocidal way. Never heard of Pat Barkers. Humanity, considering the weapons, is forced to be at its most pacific ever. Luther, by today’s standards, even the worst Muslim Fundamentalist standards, would be viewed as off the deep end. So there has been huge moral progress: we have no choice. Governmental exactions against Jews instigated by Luther, started in several German states, during Luther’s lifetime. So why 1743? Luther was an extreme example of Christian theologists, who had problem to cope with the very existence of Jews, stubbornly refusing to except Jesus as Messiah. Christianity as any other belief system that is based on dogmas, that have to be excepted as final truth, become violent against phenomena that doesn’t fit to these dogmas. And the very existence of Jews was exactly about this. Saint Augustine solved the Jewish problem more humanly than Luther. He pointed on them as wretched people, whose suffering is a proper punishments for their refusal to recognize the truth about the Savior. But as compared to Luther he was for continuous Jews existence, just not to allow them to thrive. But he lived in the fourth century, at times when the Vandals and Visigoths threatened the very existence of his community. Dear Eugen: I second what GMax said. Genocide is genocide, and that’s it. Second guessing Hitler or Luther is interesting, but it’s not the fundamental thing. Hitler did not stay popular very long. Luther is still the leader of dozens of millions, if not more. Saint Augustine also definitively was genocidal about the Jews. I have quoted the relevant passages several times on this site. Just like an encephalitis bearing mosquito, he should be crushed, not engaged in respectful exchange. Another thing about Augustine being more human than Luther: as I explained with Saint Louis, there was a progressive degeneracy into murderous racism. The Roman republic did not discriminate against Jews, nor did the Imperium Francorum, or the Renovation Imperium Romanorum. Augustine led to Saint Louis, who led to Luther, and then Hitler. So here’s a question (or three) from this new American. Would an atheist ever be voted President of the USA? Or make it as a Senator? Or be elected to Congress? Dear Paul: If you mean an official atheist, it may be difficult. But so it is from San Francisco to Vladivostok. It seems clear to me that JFK, Nixon, or Obama never believed in a deity. The first two because they flouted the basic commandments, and the later because I know for a fact he does not believe in gogod whatsoever. Why Obama mentions a deity continually? That’s part of the let’s-not-get-shot-by-a right-wing-fanatic-I-am-one-of-yours program. @ eugen: I remember reading, both directly and indirectly genocidal stuff from Saint Augustine about Jews. Genocide ain’t just about killing people. Aussies down under set up a genocide against Bushmen in the 1960s, by stealing their kids. Saint Augustine wanted Jews out of Israel, their home. That’s genocide. GMAx: When Hitler took measures against Jews, he was supported by… (some important) Jews. Hannah Arendt made lots of enemies pointing that out in detail. There are no excuse to be made for Christo-fascism. Not anymore than for Islamo-fascism. Actually less, because the former was cause to the latter. Dear gmax, agree, i intended to be ironic about Saint Augustine. He is the prove that the antisemitism didn’t start with the crusaders as contrary to some apologetic claims of the church, but is derived from the Christian faith itself. Lets not forget, that he lived in times, when it seemed that nothing will stop the destruction of Christian Roman empire, (he died when the Vandals besieged his city). Naturally his approach had to be more mild than that of Luther, who lived when Christianity looked as the superior faith. Not due to spiritual but rather material achievements, mainly colonialism and Renaissance in arts and sciences partly supported by the Catholic church, that due to Reformation made a U-turn in its pro education position. Truth the Catholic church was a very corrupt organization at the time, but as to my view, corruption of any autocratic entity is the good news, because they give hope the autocracy will collapse soon. The bad news are when the autocracy succeeds to keep its zealousness popular and murders all its real or imaginary opponents. 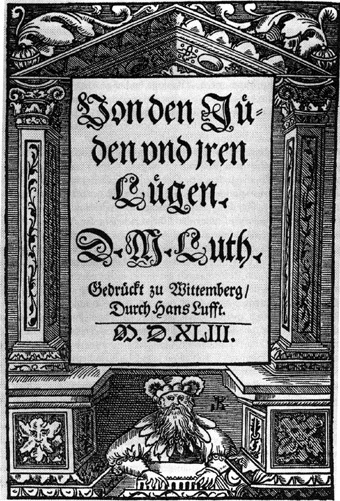 An other urban mythology is the intellectual openness of the Lutheran movement that brought to enlightenment and scientific revolution of 17-18 century. France was Catholic and its achievements were comparable to that of protestant English. The English were more lucky because of gradual and not revolutionary political change to non autocratic political system, invention of steam engine and above all, North America becoming a protestant English country rather than French. And it could easily be otherwise if not the stupidity of its kings and dictators. Yes the English King Gorge III was disastrous too, but he had the parliament that eventually forced him to come to reason (or rather to lose his reason). Dear Eugen: Ah you’re joking about Augustine? I feel better already. I feel Christianism has had a terrible effect: the dark ages, as Patrice always say. 1) The French peasants owned their land. That made them less prolific. 2) The “West Country Men” a set of very nasty plutocrats, dominated English politics, and made it viciously expansionist. They used liberal amounts of human fodder, especially from vagrants in cities… that had to be rid of. So they were offered the rope or the boast. They took the boat. By contrast, the French felt that going to America was a great honor. 3) Since Roman times, England has had readily exploitable coal. Interestingly, it’s a French professor in Germany who invented the first serious steam engines we know of, and the first steam boat (destroyed by monks). All this in… Germany. The steam engine was invented by Heron the Greek almost 2000 years before the industrial revolution, but for what usage? The important thing was not its reinvention but the usage. The English needed coal, and it forced them to make the steam engine a practical tool and the rest came because of some smart people around. One of them was Brunel, a French living in England. Dear Eugen: The Egyptians, early on, used the steam engine to open temple doors magically. That’s where the Greeks got it from, and it was used similarly. As far as the Romans were concerned, they had absolutely all the engineering, potentially, to make steam boats (paddle powered: they invented, and used massively the paddle mechanism, to measure ships’ speeds). But, of course, under the Principate, new ideas, even in tech, were officially the enemy. Denis Papin crossed the Rubicon, as he travelled more than a 100 miles with his steam boat. Everybody knew this, and could see how useful it was. As everybody knew deforestration was an acute problem (it became catastrophic in 1300 CE). As I said precedingly, Edward III took anti-pollution edicts in London around 1325 CE, because of the heavy coal burning. Coal developed more in England, because there was more of it, and fewer forests. Another French engineering team made the first (steam powered) cars… Or, rather, tanks. The program was paid by the Ancient Regime military, and the idea was the idea of the tank: go cross country. The first car accident, duly notified quickly resulted in Paris. Dear Patrice and gmax. After I read what I wrote…………”the antisemitism didn’t start with the crusaders as contrary to some apologetic claims of the church, but is derived from the Christian faith itself”, I got a strong urge to correct myself. After all Christianity is a derivate of Judaism and I will try to explain what I mean. The theological foundation of Judaism is the intensive God-human-God relation loaded with tension and activity based on recipe exactly prescribed in the Five Books of Moses the Genesis, Exodus, Leviticus, Numbers and Deuteronomy or the Pentateuch. This books of stories and law prescribe to Jews many complicated rules God ordered to follow. Most of the laws have no human to human consequences, and it is almost impossible strictly to follow them without to fail. This creates a constant relation of sin and guilt, to which the all mighty God reacts with continuous punishment, threats for the future, but also consolation and promises. One of these promises is to help the Jews to create an independent statehood under a king directly appointed by the God, the Messiah. (Messiah in Hebrew means one who was anointed, or greased, which is the part of act of ceremony of apotheosis of a king.) The best known Messiah was of course King David (Who according to last archeological findings was rather a local chieftain between the mountains of Jerusalem and Hebron than a great King). But since David times, for thousand years of Jews living in the Levant the “Holly Land”, the Jewish statehood had only very few years of real independence. In the nine century b.c. came already the Assyrians, followed by Babylonians, Persians, Greeks and finally the Romans. All these empires of the region left very little gap for Jewish independence. And after 1000 years of not fulfilled God’s promises for independent Jewish Kingdom ruled by king Chosen by God how could the Jews cope with the frustrating situation, after again the Jewish statehood was ruled by a Roman dictator, who claimed that he and his horse are God. To a Jewish believer like Jesus, his followers and many other Jews it had to be a shocking experience to see, that God allowed these people to rule the Holy Land, and it seems it is not going to change very soon. But you can’t go to complain to your all mighty God and claim your promised kingdom, viz. what happened to Job in the Book of Job. So what could the Jews do in their frustration? Leaving the belief in Torah was not an option, so some of them tried to find new definition for Messiah. Not anymore a earthly creation, but a divine creature, who’s promised kingdom is not on earth but in the heaven. All I wanted to say is that Christianity is a understandable development of Jews theological concept, of Jews living in the first century under Roman governance. So why did it become the major source of anti-Judaism? First, because in the Canonical gospels the general public watching the Jesus crucifixion ceremony was called Jews and not the audience. The second and even more important issue is, when Christianity has become the dominant political religion, they tryied to destroy every hint, that can shake the foundations of their obscure belief, and every thought that is not compatible to their expansionist intentions. So they destroyed all the gospels except of the four canonical gospels, they persecuted the Arians and many others like them, and of course the Jews, who happened to have the copyright for gospels, yet they themselves or at least some of them refused to except the ultimate truth, the truth of the official Christian church. Thanks Eugen for the long description of Judaism. To avoid the nestling effect, I put my observations about Judaism in a separate comment. Judaism and Israel are impossible to dis-entangle form history, so it’s important to have its main properties clear. One has to distinguish antisemitism, antijudaism, and antizionism. Lots of the naughtiness of Christianity comes from Bible, as Patrice said. I disagree. All forms are different names for hate towards something that is not mine yet is part of me. Did you ever heard about anti Albanism? probably not. What do you know about Albanians? I believe not much. Al I know about them, that they are unique small European nation, without to having any impact on my consciousness. I also know that they are the poorest nation in Europe. Whenever they emigrate, Italy, Serbia etc. some out of them create the most vicious criminal gangs. When emigrating massively to somewhere, like to Serbia, they forced to create a new political entity, Kosovo. Yet, I ask you again did you met ever anyone who wants to kill Albanians just because he is Albanian? I haven’t. Why? Because they have no impact on us with creating new ideas, we can like or hate but never neglect. Dear Eugen: Hmmmm… GMax seems to be a Cathar reborn s/he does not like the Bible, or rather say that “lots of naughtiness comes from it”. Meanwhile I just used (I believe the example of the Son of David). I would like you to explain to me how much abominable that is not… In a separate comment (because nestling makes them unreadable). One of my main themes is that the Bible was the Mein Kampf of whoever brandished is (Charlemagne by 780 CE). I may be the first one to brandish that idea that provocatively, but not the first to brandish it. Now for Albania: Kosovar are on the lowest rung of popularity in Europe, arguably below “Roma” (Gypsies). Albanese are not much on the radar, because, in theory, they are out of the EU entirely (that will change). Your theses seems to be the popular one of the “Genius Of Christianism” (Chateaubriand). Well, I don’t believe in it, in the sense that love was not invented by Jesus. It’s natural to man. Dear Eugen: zion is a hill in Jerusalem, and Zionism something some Jews pushe for. WAS Sharon a Zionist? Zion is a hill but also a symbol. Symbol of jews who believe that the Jews have the right for homeland at least as much as the Albanians. This need for homeland at beginning seemed to be a rather spiritual need than material so not many were interested. Then around the turn off 20 century, with rise of neoatisemitism the need became material and more Jews became interested. The Holocaust unfortunately proved how right they were. The remaining left overs of European Jews believed that they can secure their physical and cultural survival only by establishing a independent Jewish state. And then the world community feeling ashamed of its own deeds agreed to it. But since the seventies and eighties started again the old new voices continuing the tradition of St. August, Luther, the Russian Czar, you name the rest to delegitimate the right of Jews to exist as a separate culture, with all its anomalities for good or bad. This voices started under the cover of internationalism orchestrated by the imperialistic intention of the post WWII bastion of evil, the USSR. After the collapse of USSR, it’s agents who lost thear directive, out of confusion continue until today the crusade against the Jewish culture, under the pretext of anti zionism. I wonder for how long they canto nurish this internationalism pretext until they realise that the enemies of Israel the MuslimoNazis are not partners for this kind of thing, unless it will be an internationally imposed fundamental Islam on the rest of the world. Sharon was a military man and a lousy politician. As such he is man of action and not man of thought. I am interested in thought and not in acts. You may criticise acts and claim they are wrong, and still the idea behind can be right and opposite. While acts are temporary as the people behind them the ideas are not. I am myself a sort of Zionist light. Very very light, but still I believe the Jews have a right of return… Of course a problem is that some, even many, are not really returning. I generally avoid the problem of Israel because it is secondary to much more blatant problems, like Abrahamo-fascism… The way to fix the problem with not make the obsolete ones happy: one state. As to the question is Judaism a religion or nation, we have to ask what it means nation. Once I read somewhere that Stalin wrote “nation is group of people with common language and common land they occupy”. From this perspective the Jews in diaspora are not a nation while the Jews in Israel are. But who really cares what this primitive butcher has to say about the subject. My opinion is very different from his. To my opinion nation is a group of people with joint cultural heritage and a joint epical story or history they identify with. From this point of view of course Jews are a nation even if without a common land. The oddity about the Jews is that their epic story is more than a tribal-national story, it is a theological epic story or in other words a religion. It may be interesting to compare the Jewish identity with that of the Greek national identity. The Greeks have a very long history with a influence on western civilization that is comparable with the influence of the Judaism. But the modern Greeks are hardly connected to their ancient culture. They are orthodox Christians and don’t believe in their ancient myths. Their language is very different from the classical Greek etc. Yet they claim they are the rightful decents of classical Greece. Viz how they opposed the usage of name Macedonia. So what are the Greeks? nation? culture? an epic story? it just shows to you that the definition of what is nation is more complicated than what Stalin thought. 1) Judaism was a typical tribal religion. 2) As civilization grew, it transcended tribes. That’s especially true of the giant Roman republican civilization (Rome grew to 75 million, about a quarter of humanity). 3) Judaism, interpreted as a generator of nation of Israel, was therefore of no future. 4) The Judaica war, when finally general Josephus was adopted by the Roman emperor Vespasian, was a demonstration of this. 5) Smart Jews disconnected Judaism from Israel, and call that Christianity, with the help of gory details designed to make standard Judaism repellent. 6) Two ill fated wars of rebellion calmed the Jews. 7) Emperors of the Dominate decided to adopt Christianity as state religion, and, more exactly, Catholicism. Everything else was eradicated… Except the Jews, the mythical Jesus being one of them. Extermination of the Jews was contemplated in the Fifth Century, but rejected. However, when the Samaritans rebelled, they were exterminated: after all, Jesus was a Jew, not a Samaritan. 8) When the Franks were given military control of the North West empire, starting in 400 CE, as they were Pagans, and their Lex Salica was blind to religion, they re-established Jews as full citizens. 9) Starting with the madness of the First Crusade, anyone not hysterical about Catholicism was viewed with hatred. The Jews were first to pay. A reaction was Protestantism, with the Cathars, millions of them by 1200 CE. Catholics exterminated the Cathars, down to the last, and anyone who tolerated them around. 10) As Jews had been all over the Roman republic, and equal citizens, for like 12 centuries, they proved difficult to extirpate. Eugen: Is Judaism a religion or a nationalism? Hitler and Luther: ce sont des mots qui vont tres bien ensemble, as the French, or the Beatles, said. Labnut says somebody said that only 10% of conflicts were religiously based. That analysis is probably hindered by too narrow a meaning of the concept of “religion”.